Along the east coast of Africa lie the famous rift lakes; the most popular of which are Lake Victoria, Lake Tanganyika, and Lake Malawi. These deep water lakes have very steep, rocky sides and sandy bottoms. 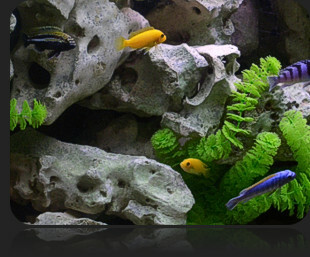 They are home to a tremendous variety of the most popular and colorful Cichlids available to the hobbyist. These unique Cichlids have well defined social structures and unusual breeding habits. White to light tan sand is recommended to stimulate the natural substrate. Various size and shape rocks should be used to create caves, caverns, and nooks. Small, grass-like plants should also be used to recreate this environment. A 29 gallon aquarium is recommended to recreate this particular niche ( a smaller size could be used, but with fewer fish). Fill the tank with two (2) inches of water. If an under gravel filter is being used, put the filter plate in the bottom of the tank at this time. Rinse the substrate (gravel/sand) and add it to the aquarium. NOTE: If using an under gravel filter, add 1.5 to 2 pounds of gravel per gallon. If an under gravel filter is not being used, then add 1 to 1.5 pounds of sand per gallon. Once the substrate has been added, fill the tank half full of water. 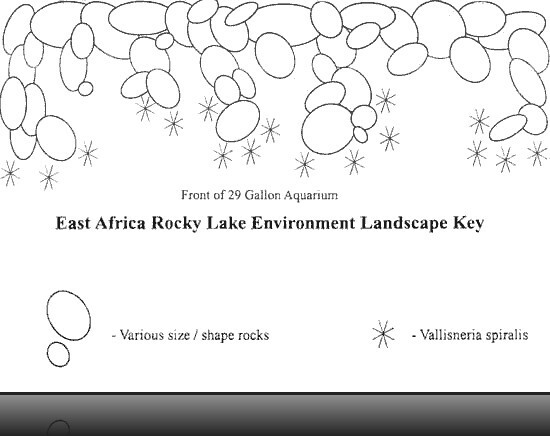 Next, add rocks and plants to recreate your East Africa Rocky Lake Environment. In this handout, there is a diagram on how to landscape this niche. Don’t forget to protect the roots of your plants as you anchor them into the substrate. A safe method is to gently ball the roots into your hand and make a loose fist. Using this fist, burrow a pit in the substrate and gently unfold your hand allowing the roots to spread out. Gently cover the roots with enough substrate to hold them down. Equip the aquarium with a filter system. If using an under gravel filter, hook up the air pump or power head (water pump) to the uplift tubes. If using an internal filter, place it towards the back of the tank and hide the filter using rocks. If an outside filter is being used, place it on the outside back of the tank, or under the aquarium. Hide the siphon tube, which draws water from the tank to the filter, with rocks. Put the thermometer in place, and add water conditioner to the aquarium. Turn on the filtration system. 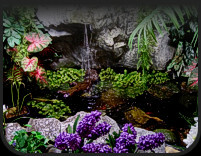 After testing the pH and water hardness, necessary adjustments can be made by using proper aquarium chemicals to recreate the East African Rocky Lake water conditions. Now, place the aquarium top in position and make any adjustments (cut outs in the back) to accommodate the heater, filter and cords. Turn on the light ( a 10 –12 hour light cycle is highly recommended) and heater. Make any final adjustments to the heater in order to stabilize a temperature between 78-80 degrees. All newly set-up aquariums must go through a filter conditioning process in order to sustain fish life (see our “New Tank Water Conditions” tip sheet for further information). It will take the water approximately 4-6 weeks to condition, during which time only a small number of fish can be added to the tank. 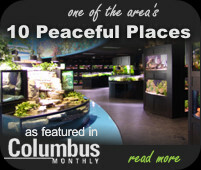 Once the aquarium has been set up and running for a minimum of 24 hours, six (6) 1.5 inch fish per 10 gallons of water can be safely introduced. For this particular niche type Pseudotropheus Zebra, Melanochromis Auratus, and Synodontias Multipunctatus Catfish would be good choices to start. Over the next several weeks, when water quality of ammonia and nitrite reach zero, more fish can be added.